Kataragama, Kacaragama in Pali, is first mentioned in the Mahavamsa in relation to the festivities connected with the planting of the sapling of the Bodhi Tree at Anuradhapura during the reign of Devanampiya Tissa (250-210 BC). The chronicle states that the Kshatriyas or the local chieftains of Kataragama also participated in the ceremony. It is interesting to note that the text contains the fact that, of the eight saplings which sprouted out of the original Bo sapling, one was planted at Kataragama. This reference indicates that a Buddhist ritual centre had developed at Kataragama from pre-Christian times although it cannot be located with any degree of certainty. When the Cholas occupied Rajarata from 1017 to 1070 AD, Kataragama became the seat of a chieftain named Lokesvara who held authority over some parts of Ruhuna. Thereafter Kataragama was occupied by an Army Commander named Kesadhatu Kashyapa, who mobilized forces against the Cholas. Although the Cholas made inroads in to Ruhuna their forces were repulsed by Kesadhatu Kashyapa and his army. Many legends trace the history of Skandha or Kataragama god, known to Tamils as Murukan or Katirkamapperumal; his junior consort Valli, the offspring of a Veddah chieftain; his elder brother elephant-faced god Ganesha to time immemorial. But textual references and archaeological evidence which are authentic tools of a historian’s craft indicate that the cult of Skandha or god Murukan gained popularity in South India only in 13 AD. It was almost at the same time or in the 14th century that the cult had spread to Sri Lanka. With the advent of the cult of Skandha and its spread in Sri Lanka, Skandha or Kataragama god entered popular Buddhism as one of the four guardian deities of the island during this time. The other four guardian deities are Upulvan, Saman and Vibhisana. The Nikayasangrahaya states that Nissanka Alagakkonara who built the fortress at Kotte in mid 14th century constructed four devalas on top of the ramparts facing the four directions and dedicated them to the guardian deities Kihireli-Upulvan, Saman Boksal, Vibhisana and Skandhakumara. The names of these four guardian deities are also mentioned in a 14th century inscription in Lankatilaka. The assimilation of influences of Hinduism and associated cultic practices into Sinhala Buddhist culture is clearly manifested in some of the constructions of the period such as the Lankatilaka and Gadaladeniya temples. Today the Kataragama shrine can be described as the most venerated and one of the oldest sacred precincts dedicated to god Skandha in Sri Lanka. It can be safely concluded that it had come in to existence by 15AD. The Siamese Pali Buddhist text Jinakalamali written in the 15th century contains the earliest reference to a Skandha shrine at Kataragama. The hymns of Arunakirinatar found in the South Indian Tamil text Tiruppukal are the oldest extant devotional hymns to god Kataragama that can be traced to the 15th century. These hymns also reveal that South Indian Saivite devotees went to Kataragama on pilgrimage. When the Portuguese occupied the coastal areas of the island, particularly after 1597, they destroyed most of the Buddhist, Hindu and Islamic shrines in those areas and plundered their wealth. Among many of them were the Kelaniya temple, Kandevihara at Alutgama, Munnesvaram Kovil at Chilaw and Konesvaram Kovil at Trincomalee. Having heard of the abundance with which devotees made offerings at the holy place, in 1642 the Portuguese attempted to destroy the shrine at Kataragama and plunder its wealth. But they could not even locate the place of the shrine. The Portuguese writer Rebeiro, who was in a group of 150 Portuguese soldiers and 2,000 Laskarins, under the command of Gaspar Figuere de Cerpe that went to locate, plunder and destroy the shrine, had stated that they heard about the offerings of gold, jewels and precious stones kept at the shrine. He states “…we had several times made inquiries about it in our desire to obtain this wealth… When we came near the spot where they said the pagoda stood, we captured a native residing close to the spot, and our commander inquired from him if he knew where the pagoda was. He replied that he did, and that it was close by, he acted as our guide and led us through a hill covered with forest which was the only one in that district, and this we wandered round and round and re-crossed many times. "It was certain that the pagoda was at the top of it but do not know what magic it possessed, for out of the five guides whom we took (later), the first three were put to death because we thought that they were deceiving us, for they acted as they were mad and spoke all kinds of nonsense, each one in his turn, without the one knowing the others. The last two deceived and did exactly the same, and we were forced to turn back the way we had come without effecting anything and without even seeing the pagoda which is called Categao”. In his 1681 writings Robert Knox had stated that those who fetched salt from the salterns (in Hambantota) had given offerings to the god who dwelt at Kataragama. Writing in the early 19th century John Davy specifically referred to the Kataragama devale dedicated to god Kartikeya which attracted pilgrims. According to the Manual of Uva, written by Herbert White and published in 1893, the annual festival of Kataragama lasted a fortnight during which period pilgrims from all districts of Ceylon as well as from South India travelled there. The British never patronized these sacred places. It was only after independence that some development came about in the sacred precincts. Notwithstanding the development work, the two simple apartments that consisted of the original Kataragama Devalaya have not been subjected to any major structural alterations. 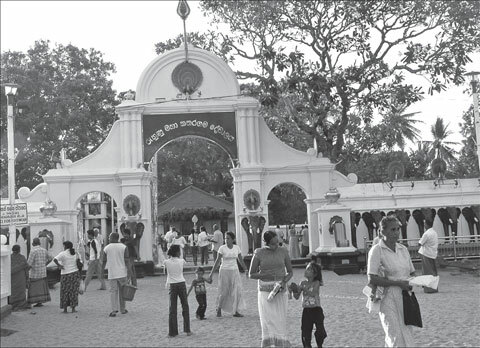 The legends, myths, beliefs and rituals associated with the Kataragama god represent a convergence of cultural traditions of Hindu Tamils, Sinhala Buddhists and Veddahs transcending ethnic, sectarian and even class barriers, thereby making it a sacred place flocked to by an exodus of believers of different faiths.